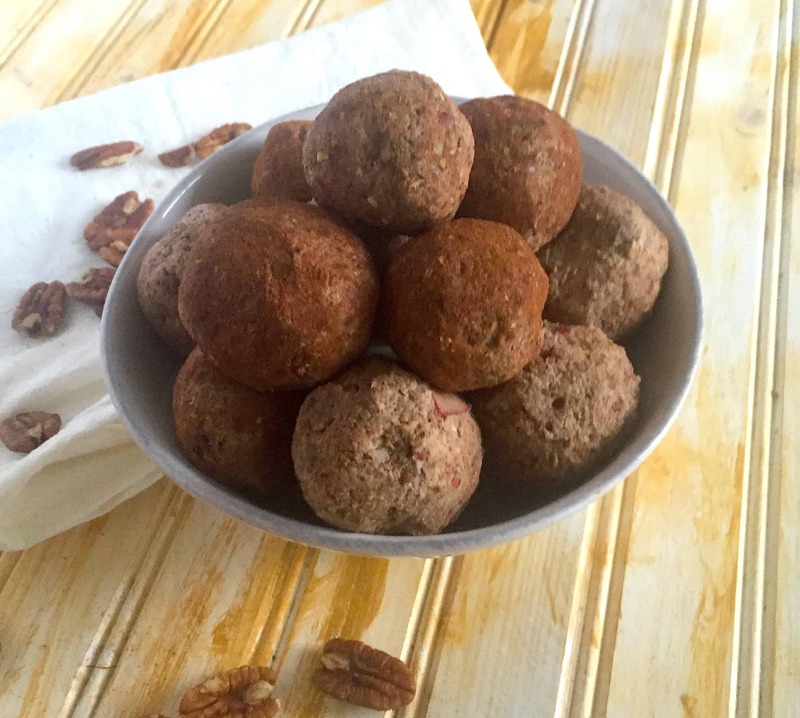 These energy bites combine pecans and oats with apple and dates to create a chewy sweet treat. 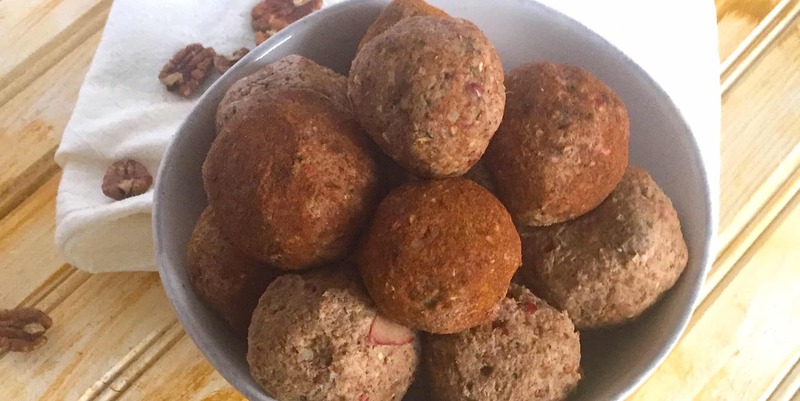 These energy bites are one of my favorite transportable healthy snacks. There’s just something so deliciously classic about the combination of apple, pecans, oats, and cinnamon. Let’s be honest – they’re also way easier to make than actual apple pie. The ingredients in this recipe are pretty simple and you probably have most of them on hand already. Apple: Opt for organic if possible and use whichever type is your favorite! (I’m a Gala girl.) Apples are a great source of soluble fiber, which benefits digestion and supports weight loss by increasing satiety. Oats: Oats are another source of healthy dietary fiber. They also contain beta-glucans, polysaccharides that may boost the immune system and help keep blood sugar levels stable. Dates: Dates are my favorite natural sweetener. Besides sweetness from carbohydrates, (great for quick energy!) dates provide fiber and essential minerals like potassium and magnesium. Pecans: Pecans are a great source of healthy monounsaturated fats that have been linked with improvements in cholesterol and blood lipid levels. Hemp seeds: Hemp seeds are my favorite add-in for an extra boost of plant-based protein. They’re also a source of essential fatty acids. Apple pie flavorings: Last but not least, you’ll need vanilla, cinnamon, and nutmeg so make these babies taste like a bite of apple pie. To prepare, just toss everything in the food processor and pulse a few times, until everything is well-combined. Process more if you prefer a smoother texture. The result should feel a little bit like dough. Grab about a tablespoon at a time and roll into a ball with your hands. I love these rolled in extra ground cinnamon but feel free to skip this step. You’ll want to cover and store them in the freezer to set for at least a half hour before serving. They’re great for tossing in your bag for a healthy on-the-go snack but I also love them for a wholesome dessert. Sometimes, I just want a bit or two of something sweet and these totally hit the spot. 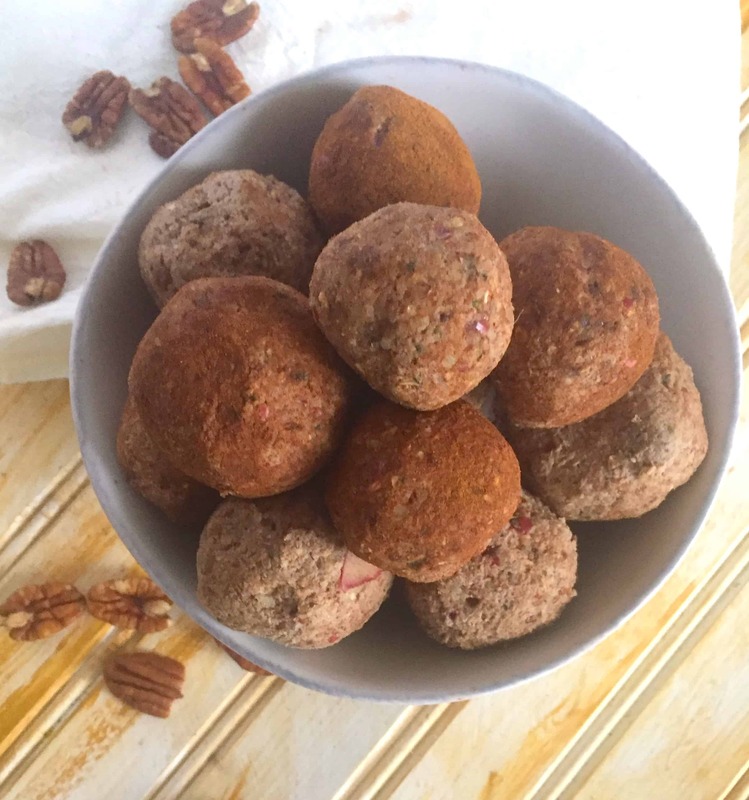 Sweet and full of spice, these date and nut energy bites are like a slice of apple pie...to-go! Combine ingredients in a food processor and pulse until dough-like consistency formed. Use hands to roll dough into balls, roll in cinnamon if desired, and store in freezer for at least 30 minutes before serving. Want 30 more healthy breakfast recipes like this one? Sign up to receive my free downloadable cookbook! This month’s Recipe Redux theme is all about pie! You can find more delicious recipe inspiration below! Yum! 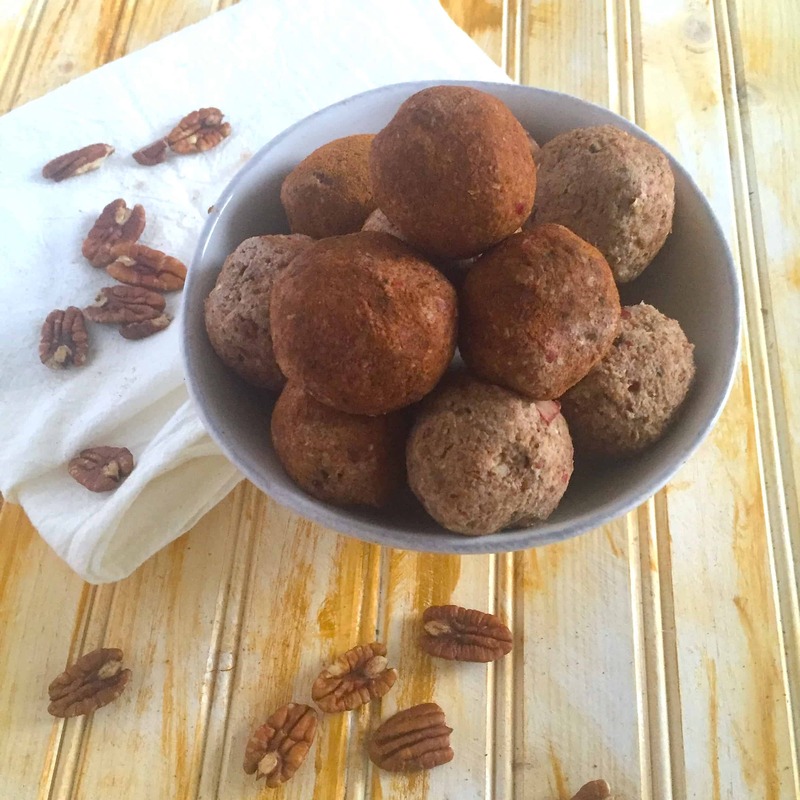 Apples and pecans are a great combo together! Thanks, Rebecca! So good, right?! Thanks, Sarah! They’re super convenient for taking to the gym or running errands! Thank you so much for these kind words, Lee! My blog is my happy space to share tips and recipes with others. 🙂 Please feel free to share away and let me know if there is anything else I can help you with!